Join us in the mission! Click the button below to donate online or using major Credit Card. Use the field "special instructions regarding donation" to advise if the donation is a tribute. In that field, include the name and address of the person honored and whom to address a notification of your donation. Advise if the donation is a tribute. Include the name and address of the person honored and whom to address a notification of your donation. 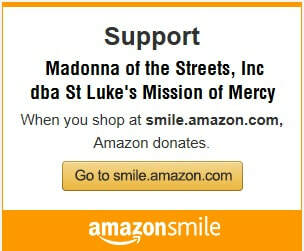 ​Donations to St. Luke's are always welcome and greatly appreciated. God will never be outdone in generosity and our prayer is that God will bless you and your family in great abundance for your assistance in caring for God's poor. Our Apostle program stands for A Part of St. Luke's Everyday. An A.P.O.S.T.L.E. is a true lifeline to people in need. Please join today! Your automatic monthly gift will guarantee that people in Buffalo are fed, sheltered and cared for as they regain control of their lives. Email stlukesmission@gmail.com with APOStLE in the subject. Please ask for the APOStLE sign up package & include your name, complete street address, phone # & email. We will send out the APOStLE enrollment forms & labels for you to use. Return the form with your first APOStLE donation. If you entered information on your tribute in the "special instructions" field, then this isn't necessary. Please click the DONATE button above to process a donation. This isn't a donation, it's only an email. Only complete this form so that we can properly acknowledge your donation, if you weren't able to enter information during the donation.